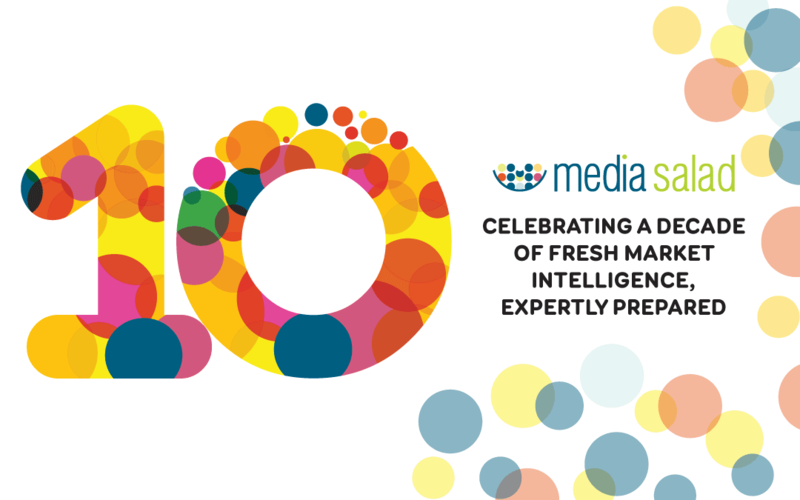 This year, Media Salad is delighted to celebrate its 10th anniversary. Over the last decade of building our company, we’ve learned so much about what it takes to grow a small business — and what it takes to be the kind of people who can weather the ups and downs with integrity and friendships intact, which is a really big deal all by itself. 1. We launched during one of the worst economic downturns in U.S. history — and we’re still here! In this case, trite is right: Where there is a will, there is a way. Going out to market to shop to busy executives a concept they had never considered — the idea that experienced news reporters could deliver to them market information they did not have time to find for themselves and their teams — was tough. But the first check was signed — and then the next and the next. Today, Media Salad serves organizations ranging from Fortune 100s to small nonprofits. 2. We’ve helped good companies that employ outstanding people win business at times when they were struggling. The Media Salad team often works carefully with industry experts to prepare business proposals that our clients hope will lead to business deals. We might provide technical writing, editing, document design and layout. We may design original graphics to illustrate complex plans of action or workflows. In the last decade, we have stood alongside business owners facing tough times, particularly in the construction industry — and receiving emails and phone calls from clients who say, “Guess what! We just got the contract!” has been one of our greatest joys. 3. Everyone has been paid on time. That may not sound like a big deal, but anyone who has started a company knows it is. 4. We have helped companies make and save money and recruit and retain the best people by improving their internal communications. Every day, thousands of business professionals worldwide tap into resources and information provided by Media Salad’s skilled business writers, editors and graphic designers. We design, build and maintain corporate Intranets and document libraries for internal communications, running these information systems with the efficiencies and standards of news organizations. Our team members work alongside global executives, helping to ensure their business goals are communicated clearly and adequately throughout the organization. We train employees from all business backgrounds — including IT support, marketing, vendor management and office administration — on best practices in business communication, and we show them why and how to share important information across the enterprise. Our approaches to internal business communications unclog employees’ email inboxes, empower them to “self-serve” to find the answers to their questions and help ensure they have the resources they need when they need them. 5. We’ve remained committed to a positive work/life balance for our employees and our clients. There are many ways throughout the year that Media Salad lives up to this promise — but maybe our favorite is our tradition of taking time off the week between Christmas Day and New Year’s Day, with the CEO on call. 6. We’ve served an extremely diverse group of clients. Media Salad lives up to its name in the sense that our services are adaptable for individuals; small businesses; and large companies. Our team members have tackled projects in the arts, banking, construction, cybersecurity, electronics, healthcare — and chemical-free cleaning, just to name a few. 7. We’ve worked only with individuals and organizations we respect. We need to do all we can to sleep well at night. 8. We give. In the grand scheme of things, our corporate gifts might not appear to be a big deal, but they’ve made us happy. 9. What we deliver, we deliver with excellence. Media Salad provides only the services our clients need. We don’t oversell. We do only what we know can help. We will stack our finished products — and our prices — against other communications consulting firms every day of the week. 10. We’ve built great trust in business. Our clients know we tell them the truth — warts and all — and that they can count on us to live up to (and often exceed) our commitments. They know Media Salad deals with integrity, follows up — and always, always hits deadlines. We’re sending an especially big thanks to all of the companies that have helped us make Media Salad what it is today. We really couldn’t have had as much success or fun without you.